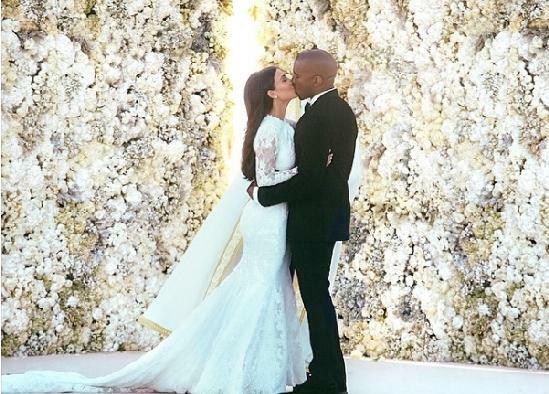 *Would you believe that upon release, Kimye‘s wedding photo has become the most-liked Instagram ever! In the photo, Kim Kardashian and her newest husband, Kanye West, are seen kissing at their ceremony in Florence, Italy. It has received more than 1.9 million likes since it was posted May 27, passing the 1.8 million likes that Justin Bieber’s photo with Selena Gomez has garnered in the past five months. Kardashian (who has added the last name “West” to her Instagram account) also posted a photo of the couple holding hands as they walked up the aisle, which has more than 1.5 million likes. Billboard says wedding guests took to Instagram and Twitter to share moments from the reception, Givenchy creative director Riccardo Tisci posted a photo of the dress he designed for Kardashian, and the couple chose the online platforms to share their first official wedding photos. Not “one” post from the “HOH”‘s! ?…(Haters Of Happiness”!) Ehh….”figures”.